Berlinica Publishing LLC, 9781935902829, 168pp. 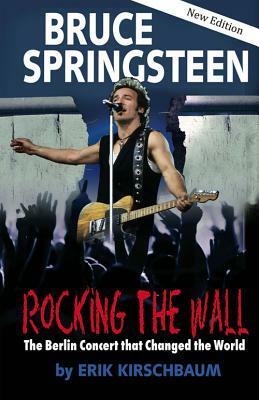 Uncovering the story of the epic Bruce Springsteen concert in East Berlin on July 19, 1988, this revised edition contains additional color photographs and a new preface by a Bruce Springsteen band member depicting how the Springsteen concert in Berlin changed the world. Research was collected from dozens of fans, participants, and organizers, as well as Jon Landau, Springsteen’s long-time friend and manager, who unearthed old newspaper clippings, TV tapes, Stasi files, collected photos, and memorabilia. Take a trip with Springsteen and be transported to the divided city, where The Boss, live on stage, delivered a bold speech calling for all barriers to be torn down to a record-breaking crowd of more than 300,000 delirious young East Germans full of joy and hope. Their tremendous, powerful cry for freedom became the "final nail in the coffin" of the Communist regime, which subsequently led to the uprising that brought down the Wall. Erik Kirschbaum is a correspondent for the Reuters International News Agency, a nonfiction author, a longtime Springsteen fan, and an unabashed crusader for renewable energy. He has written about topics anywhere from entertainment to climate change in over 20 countries. He lives in Berlin. "An illuminating and impressively detailed examination of a frequently overlooked moment in the nexus of rock music and political liberation. I learned a great deal and enjoyed doing so." —Eric Alterman, author, What Liberal Media?